At Lice Free Noggins, a mobile in home head lice removal service in Brooklyn, NY, all of our highly trained Lice Treatment Specialists are experts when it comes to head lice treatment and nit removal. Our highly trained staff will not only end the cycle of head lice but also provide you with the education and hands on training needed to prevent future outbreaks. What makes Lice Free Noggins the preferred lice treatment service in Brooklyn? Attempting to get rid of head lice on your own can be a very trying experience. What makes Lice Free Noggins stand apart from other lice removal companies is that our Lice Treatment Specialists have a passion for the head lice removal services which Lice Free Noggins provides. Our Lice Specialists will quickly and accurately screen all household members and treat those, which are affected, in a thorough and efficient manner using products which are natural, eco-friendly, and pesticide free. Our expert lice technician will come out to your home and first confirm the presence of lice and/or nits. If positive, an all natural solution, the Lice Free Noggins Comb Out Spray, will be applied onto the hair. This solution works to kill any live lice. The technician will then proceed to comb out the lice and nits with a nit comb. After a meticulous treatment, the lice technician will look through the hair to be sure that all nits were removed. Expertise is important here as if you leave just one nit in the hair, the infestation cycle will start again. We charge an affordable flat rate for lice treatment based on length of your hair and not by the hour. There are never any hidden fees – NO travel fees, NO holiday fees, NO evening or weekend fees. Brooklyn, NY’s #1 Professional Head Lice Removal Specialists! Head lice checks for the entire family. Same day lice removal treatment to eradicate lice/nits. Educate your family to reduce the likelihood of re-infestation. We can provide you with Lice Clearance Certificate if one is necessary for your child’s school. Low, flat-rate pricing for lice removal treatment. Rest assured with our fully-trained and experienced lice professionals. A certified clearance certificate that can be taken back to your child’s school, camp or daycare explaining the services that Lice Free Noggins has performed. This certificate is our assurance that our work and your dedication to follow up is reason to be confident that the lice infestation has been resolved and is recognized by many schools and child care agencies across the New York Metropolitan Area. Getting rid of head lice does not have to be a stressful experience. We offer best lice treatments for adults and kids. Chemical-free, safe, effective, and fully guaranteed lice treatment service. We have successfully treated thousands of families in Brooklyn and we can help yours today! Call Us for Head Lice Removal Treatment in Brooklyn, NY. Get Rid of Lice in Just 1 Appointment! Why Choose Lice Free Noggins Head Lice Removal Services? "A" Rated by the BBB - Lice Free Noggins impeccable reputation has earned us this rating with the Better Business. Bureau. There are no barriers to entry in the lice treatment business so you have to be very careful that you are choosing a lice service company that will be here tomorrow. There is no industry-wide certification process so if a lice company claims to be "certified" it means that they are calling their own training process a "certification"
We've treated over two thousand families in Brooklyn. We focus on providing the highest quality service by following a standardized lice removal system. Our lice services are quick, pain free, competitively priced and NO Travel Fees! Unique Head Lice Removal Method - Our head lice removal method is non-toxic, natural, safe for all ages, quick, and effective. All of our lice treatment services are backed by a 100% guarantee. Success - We have successfully treated over 2000 families using our own developed head lice removal method, which has proven to be 100% effective. Convenience - No need to spend hours at a lice salon waiting for your turn. Why have your kids sit for hours in an unfamiliar place when they can be in the comforts of their own home? Efficiency - In home service allows a family to utilize their time efficiently. Children can continue with their home activities after being checked or treated for head lice. NO wasting time driving, parking, waiting. Cost Effective - We charge a flat rate for lice removal. Many lice removal services charge by the hour, which can add up rather quickly. There are never any hidden fees - no travel fees, no holiday fees, no evening or weekend fees. Confidentiality - Although there is nothing wrong with having head lice – not everyone wants to be seen walking in or out of a lice salon. Having a treatment in-home is as private as it can get. Flexibility - We accommodate your busy schedule. We have known to serve clients as early as 5 am and as late as midnight. Busy parents say Yes to house calls! Education - We educate families on how to prevent head head lice in the future, and how to treat on their own if an infestation does occur. Stress Free - We take the stress out of head lice removal and make the experience as pleasant as possible. In home lice treatment service also cuts the risk of a lice-free child or parents contracting a case of lice from a lice salon – which does happen. Professional - Our technicians come with all the tools necessary to treat a family for head lice in a quick and effective manner. The lice technician cleans the surrounding space used for treatment, leaving the area free from any possible nits and/or head lice. I had a very excellent experience and Im thankful to them that we got ride of the little unwanted critters that was disturbing my daughters hairs. Thank you catherine for been so thoughtful and for been so professional this is something I appreciate a lot due to I had tried so many different shampoos and nothing seem to work but once I pick up the phone and made that called they told me where I had to go to make an appointment. It was a same day appointment I was so HAPPY & SUPER SATIFIED WITH THE SERVICE I WAS PROVIDED. I can't imagine a better service of this type. I filled out the online form and Sarina showed up within 45 minutes. Sarina did a fantastic job with my family. She treated my two children and my wife and was at our apartment for hours. She was thorough but also extremely good with the kids. They were comfortable and happy the entire time. She brought calm and professionalism, as well as a good sense of humor. Lena, who owns/administrates the service communicated very quickly, and made the whole thing a breeze. Look, I wish I didn't need their services, but when I did they came through in a big way. Thanks! When my head was itchy and I saw some signs of lice in my daughters head, I literally thought I would die at the thought of having lice. My husband and I googled and found Lice Free Noggins and even though we called on a Saturday night around 8pm, Lena came to our house and took care of everything. She was absolutely amazing, was great with my toddler and took her time and was very thorough and so helpful. She explained everything to me and really put my worries at ease. She treated myself and my daughter and combed out each of us and assured us we were clear before she left. The prices were so reasonable (and actually seemed inexpensive to me) considering the anxiety and panic I would have been having if not for Lena. She sent us after care instructions and even answered some texts I sent her about questions regarding the house letting me know I could relax and that I didn't need to worry further. She left a treatment for us to repeat in 5 days and will do a check up again if you think you need it. Lena was a LIFE SAVER. I hope I never have to deal with this again, but if I ever did, there is NO ONE else I would call or recommend. Amazing service, thank you so, so much! I don't have any experience with lice removal services - but sadly my toddler picked it up somewhere. I treated everyone and washed everything, but was still finding nits days later. So I got paranoid and needed to put an end to the ordeal once and for all. I researched services online and decided to call Lice Free Noggins on a Friday night before the holiday weekend. Everyone with whom I spoke was lovely and knowledgable and Lena arrived at the house within a couple of hours from my original call. She was kind and courteous and my 2 year old hugged her as soon as she walked in the door (good vibes!). Lena checked all 5 of our heads and treated all of us, taking her time to thoroughly remove all the nits by using a multiple step process of combing every which way very methodically. She also educated us about future prevention and recommended several products and behaviors to make sure we never have another experience like this!! It's expensive - to be sure - but Lena and Lice Free Noggins gave me the peace of mind I needed to finally sleep for the first time in a whole week! Our first case of head lice and Lice Free Noggins was at my house same day and cleaned everyone's heads in the house as well as educated on us on how to take care of clothes, furniture, brushes, etc. they put me a little bit more at ease for a very stressful situation. So thankful for Lice Free Noggins! I have been trying to remove lice from my children for the past few weeks with no luck. It was becoming a very stressful situation for myself and the kids alike. I researched several lice removal companies and decided to go with Lice Free Noggins for many reasons. Lena, the owner, was very kind, understanding and informative. She immediately put my mind at ease. A technician came to our home within an hour and was equally amazing. After treating my girls and thoroughly checking me, my mother and the babysitter, she went over, in great detail, what we should clean and how to prevent a future encounter with lice. I love that their rates are very fair, especially when compared to some other companies out there. I hope to never deal with lice in the future, but if we find ourselves in a lous-y situation, I will definitely be calling Lena and her staff. Thank you! You never want to find out your kid has lice, but if you do, this is THE place to call. I gave my 13 year old daughter 2 in home treatments before succumbing to the fact that I couldn't possibly do this on my own (lots of hair, lots of nits and ZERO experience), so I gave them a call. Lena was patient and understanding and had Janine at my house within a few hours. Janine was AMAZING! She was calm (because I promise you I was so grossed out by the situation), she was gentle and she explained everything she was doing as she did it. Her work was thorough and extensive and her conversation was pleasant as she removed the nastiness that was all over my daughter's head. The whole ordeal was over within 2 hours, (mind you, I spent 2 hours on her head earlier with over the counter treatments that clearly did nothing), and normalcy returned. Janine showed me how to use the comb to check my daughter's head 5 and 10 days post treatment and, I'm so glad to say, my daughter is clear. I've never experienced lice or nits and I hope to never experience it again, but , if I do, I won't hesitate to call. Care of this horrible experience we had with our 3 year old daughter. We noticed our daughter with a head full of lice and were recommended to lice noggins. They were as professional as you can get. Came to the house first day and took care of it all. Besides they came few days later to double check everything was out and had a great outcome. I recommend lice noggins to everyone that comes across this terrible experience. Thank you for everything lice noggins. Lena from Lice Free Noggins is an efficient professional and a very nice person to deal with. She came to my house after just one phone call on the same day and made the whole process simple and calming. I value her services very highly and will turn to her again if need be as well as recommend her to my friends and family. Nina is wonderful at her job. Very thorough and very polite. She answered all my questions and made me feel better. If you want to be checked and/or treated for lice, Lice Free Noggins is the company to call. As this was our first and hopefully last experience with lice, I asked friends for advice and more than once was referred to Lice Free Noggins. I called after official business hours and was very patiently listened to by Lena who very calmly described the options available to me and my family. She put me at ease within minutes and I was even able to concentrate on making dinner after our call instead of freaking out over the possibility of having lice. I made an appointment for the next morning. Lena arrived exactly on time and got straight to work. After 3 hours of combing out my family's hair, we were lice free! Lena went over detailed instructions on how to rid the rest of our home of lice and also how to best prevent us from getting lice again. I heartily recommend Lice Free Noggins and will only use them should these pesky bugs visit us again. After our first experience of being told "your child has lice"-- we went into a panicked tailspin. 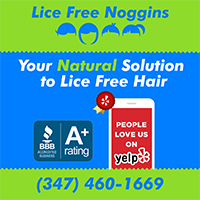 After calling multiple unavailable professionals on a friday night, we found Lice Free Noggins via positive yelp reviews and are we glad we did! Lena arrived within 2 hours of calling her, calmed us all down and checked everyone. She was incredibly thorough and got everything out of my daughters hair using non toxic products. She was also very knowledgeable about the life cycle of the lice, so we could understand how long my daughter had it and what the risks of passing it along were (luckily very low- since to her it was considered a VERY mild case). Additionally, she helped guide us on exactly what do to around the home to contain any possible spread. She not only helped us, but educated us, and that we are very grateful. I will recommend her to everyone. If you have a school age child you need to have her contact info in your phone! I was very pleased with Lice Free Noggins. They returned my call immediately and sent Melaina quickly. She thoroughly checked the entire family and treated one child. She was efficient, personable and made the whole process seem less upsetting. I would highly recommend Lice Free Noggins. Lena was great, she made a terrible experience the best it could be. She was very responsive in setting up a time to meet, came the same day we called, was very knowledgeable, and had reasonable flat rate prices. She was at our house for hours! It was wonderful to have someone come to the house given my 6yr old is very active and the thought of bringing him somewhere, having his hair checked, and then his having to wait around while my long hair got checked was daunting. Lena was meticulous, gentle, reassuring, personable, and professional. I highly recommend her. Lice Free Noggins is fantastic. This was our first experience with lice and after an unfriendly check at Licenders (and being told that everyone in the family had to be treated, even without evidence of lice on anyone else) we gave Lena a call. She was friendly and kind and was willing to come right away. Her rates are far more reasonable than any of the 'lice salons' that I called and she comes to you. She wiped out the problem in less than two hours and my daughter didn't cry or flinch once. I can not recommend Lena and Lice Free Noggins enough. While we hope never to have to deal with lice again, if we do, I would call Lice Free Noggins immediately. Lena is a lifesaver. Not only did she respond quickly to my initial call but her concern for us was evident from the start. She was awesome with my son who is impossible to keep still under normal circumstances. She rid us of our pests and gave us peace of mind but also treated us like friends. Tough way to meet a friend but she made it easy and I would recommend her to anyone in need of help with this situation. This was not my first experience with lice or a lice consultant but she was clearly the better of the two I have dealt with. After trying several over the counter remedies that simply did not work and still finding nits and a lively critter or two we turned to Google and found Lena. Lena was quick to respond to our plea for help and was able to see us the same day. Friendly, efficient, informative and such a pleasure to deal with. Lena was able to explain what was occurring, why our previous efforts may not have worked and what our next steps should be. I agree with an earlier post in that some places seem to try and take advantage of the situation to "hard sell" their products and over price themselves but Lena offered her suggestions and advice and we made our decisions and the pricing was reasonable as well. I can strongly recommend her should you ever find yourself in need of this service. Thank you Lena, you were fantastic! Lice Free Noggins saved my life! This was my first time with lice, and I was pretty freaked out! After doing quick but intense research to get this taken care of immediately, I called Lena and had the most pleasant conversation with her, AND she could come the same day! I was SOLD! Lena came over and spent all the time necessary to treat my daughter's massive curly head of hair, with no rush and great precision. She then followed up on a daily basis with us, and came back 5 days later to make sure all lice had been eradicated, which they were! Professional in-home head lice removal and head lice treatment service in Brooklyn, NY. We offer a safe and effective head lice removal treatment for your entire family. Our lice treatment products are natural and non-toxic. We guarantee to eliminate your family's head lice & nits in just one visit. Flat rate pricing and NO travel fees!